DustBoss provides air and surface dust control using atomized mist. High-efficiency dust suppression equipment has been credited with helping one of the nation’s leading environmental cleanup firms complete the remediation of a former lead-acid battery recycling facility, without a single dust-related incident. In response to concerns over the potential for lead-contaminated dust migration during the 18-month project, engineers have successfully complied with a zero-dust standard to protect the local environment, avoiding costly downtime and potential fines, while simultaneously eliminating the need for labor-intensive manual spraying. SCE Environmental (Dickson City, PA) is performing remediation of the Marjol Battery Site, adjacent to the Lackawanna River. The cleanup includes excavation of more than 200,000 cubic yards of impacted ground and construction of a 9.5-acre landfill and cap to contain the contaminated soil. Officials involved with the remediation have estimated that savings in manpower alone can reach $7,000 per month while the dust suppression equipment is in use, and conservative projections indicate that more than $1/2 million in lost time and expenses will likely be avoided over the course of the project. The DustBoss helped eliminate downtime for SCE due to the migration of contaminated dust. “Our contract stipulates that any visible dust in the air is cause for shutdown until the area can be saturated,” explained SCE President Jody Cordaro. “Even if this only happened occasionally, and even if it only cost us a couple hours of total downtime each week, it’s a potential loss of more than $30,000 a month. That’s just not acceptable,” he said. Throughout the excavation and transport of the contaminated soil, the residential location of the landfill dictated that dust control had to be a high priority, and in fact it was a specific point in the USEPA / PADEP final decision on a remedy for the site. Of specific concern was a “high-hazard” pile: 29,000 yards of dirt containing high levels of lead, which also had to be moved to the permanent landfill. This hazardous material was exceptionally dry after being encased in a liner for more than 15 years, creating the potential for substantial dust generation. Airborne particulate levels were measured in a number of ways, including visual monitoring and perimeter high-volume air monitors. Workers also wore personal air monitors, which take time/weight average samples to determine if lead is present. Representatives of the U.S. EPA, PA DEP and U.S. Army Corps of Engineers were all on site to oversee air quality monitoring. SCE engineers knew that manual spraying with a hose was only marginally effective for surface wetting, and that the technique had virtually no chance to knock down airborne particles. Compliance with the unforgiving air quality standards would require a dust suppression option that could provide both surface wetting and airborne particle control, while avoiding oversaturation. The desire to avoid oversaturating the area was not due to potential leaching of the lead contamination into the water supply, as the water table in the area is about 200 feet underground. Instead, it was the fact that 25–30 pieces of heavy equipment were working and moving about the job site at any given time, and the large number of truck loads bringing in clean fill — as many as 175 each day. Saturated ground would cause puddling and create large volumes of mud, complicating access to the work areas and creating the potential for run-off. DustBoss suppressed fugitive dust particles at SCE. Engineers were seeking a highly-efficient dust control system that could cover large areas, and they preferred an automated method that could run unattended for long periods. With the help of an Internet search, SCE located the DustBoss® from Dust Control Technology (Peoria, IL). 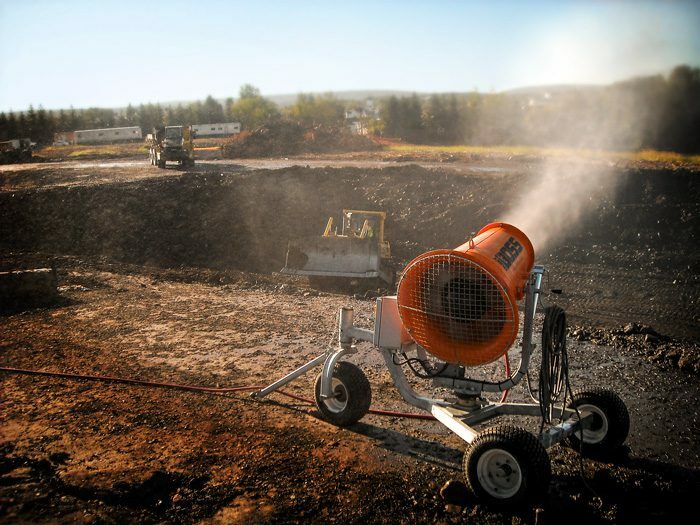 The company’s versatile DB-60 is an oscillating ducted fan design, able to cover nearly half an acre with a powerful mist of water droplets atomized to the optimum size for dust suppression. From his research Cordaro learned that the device was capable of creating a dust barrier “curtain” that would drastically reduce any potential for airborne particle migration into the local community, and the company decided that it was the best option for confining dust to the immediate area. SCE crews used the DustBoss® throughout the excavation, at times positioning the unit directly over the high hazard pile during its relocation to the permanent landfill site. According to Cordaro, there were no incidents recorded by any monitor of dust levels that would trigger even a temporary shutdown, an accomplishment he called “...unheard-of in projects of this magnitude. The DustBoss gave us great peace of mind,” he concluded. “It was very effective in this application.” Final work on the Marjol site is scheduled into 2009. Upon completion, the landfill will be operated, monitored and maintained in perpetuity. Find a way to control large volumes of dust from a former lead-acid battery recycling facility during construction of a permanent landfill, confining surface dust to the immediate area and preventing airborne particles from migrating to nearby residential communities. Crews successfully complied with a zero-dust standard to protect the local environment, avoiding downtime and potential fines, while eliminating the need for manual spraying. Projections indicate that more than half a million dollars in lost time and manpower expenses have likely been prevented. is a full-service environmental contractor with four offices in the U.S., serving government agencies and public, private and commercial industries throughout the country, as well as the Caribbean and South America. The company provides a comprehensive range of services, including industrial cleaning, decontamination, demolition, site remediation, transportation, disposal and emergency response. is a leader in effective dust and odor control solutions for the cement, coal and power, concrete and aggregate, demolition, recycling and scrap, steel and slag, and waste transfer industries. The company's DustBoss product line helps reduce labor costs, freeing up manpower for more important tasks. The automated units also use less with some customers realizing payback in as little as 6 months and netting an annual cost savings of more than $50,000. This entry was posted in DB-60, DustBoss, Environmental Remediation, News, Recycling / Scrap, Uncategorized. Bookmark the permalink. Both comments and trackbacks are currently closed.